Most people think of gin & tonic as a British drink, but in recent years it’s actually in Spain where it’s become most popular, so much so that it is now considered the national drink. On one of his trips to Madrid, Chef David Lee visited the city’s gin and tonic bars and was inspired to bring the Spanish-style gin & tonic here to Toronto. Fast forward to today – Nota Bene‘s G & T Program has been around for some time now, but if you haven’t discovered it yet, now’s the perfect time to do so, especially with the introduction of the new 4 TO 7 snack menu (but more on that later). The gin & tonic is a simple drink, but the Spanish have raised it to the next level. 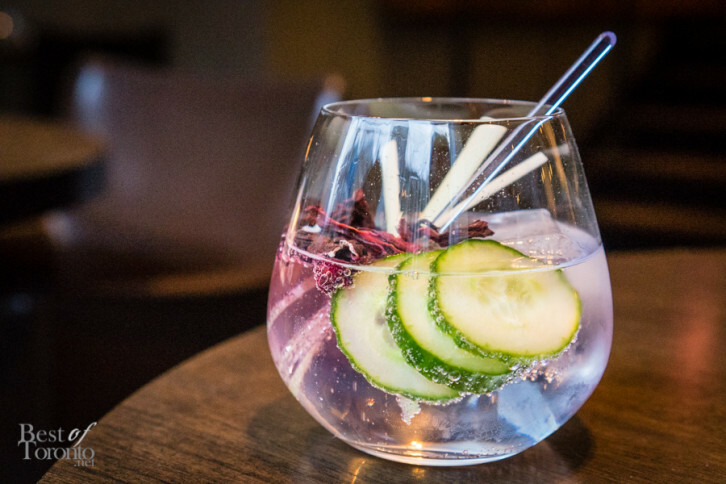 It has a few key components – the gin and tonic of course, but arguably just as important are the garnishes and the style of ice. At Nota Bene, there is a selection of twelve different gins from Canada, U.K., Scotland, Netherlands and France. For tonic, there are three to choose from – Fever Tree, Schweppes, and Nota Bene’s own house tonic. For the ice, you can choose large, cubed, or crushed. And finally for the garnishes, you have cucumber, hibiscus, and lemongrass. If you don’t know your gin, the friendly Nota Bene menu provides descriptions of the flavours you can expect from each of the gins. With a varied selection, surely there’ll be one that will suit your taste. The same goes for the tonic – the flavour profiles vary as well, and there’s also the added consideration of how bubbly you want your tonic to be. For the style of ice, you choose based on how much dilution you desire. If you want your gin and tonic to taste stronger, then you’ll want less water mixing in from the melting ice. The ‘large’ is literally a large cube of ice, which will provide the least dilution. On the opposite end of the spectrum, the ‘crushed’ will provide the most dilution. We tried two different gin & tonics, each representing an extreme. The first used Citadelle Gin from France, and Fever Tree tonic. To me this is the classic gin & tonic combination. As it is a lower proof gin, the large cube of ice is preferred. The second used Botanist Gin from Scotland, the Nota Bene house tonic, crushed ice to tame the higher alcohol content slightly. The flavour here was significantly more pronounced and very different from the first gin and tonic, but just as enjoyable. It was recommended that we add the garnishes a little at a time to control the intensity of the flavours. Indeed each of the hibiscus, lemongrass, and cucumber added its distinct flavour to the gin & tonic, so this advice was very helpful. With so many different combinations available, you really can create a very personalized gin & tonic. For $17, you get two ounces of gin, the tonic, all of the garnishes, and the style of ice you prefer, served in a fishbowl-style glass. While the G & T program is a great reason to visit Nota Bene, beginning April 13th you have even more reason to go. The new 4 TO 7 snack menu runs from Monday to Friday, and from 4 pm to 7 pm, items are only $4. After 7 pm and until closing, they are only $7. We sampled some of the dishes from the new menu, and we are happy to say that each lived up to the high quality and standards we’ve come to expect at Nota Bene. One of our favourites is the pork belly, ever so crisp on the outside and tender on the inside, with the classic apple pairing adding sweetness, and the poblano pepper balancing with some heat. Another favourite is the extremely tender sliders cooked to medium rare and topped with Oka cheese and maple bacon. We enjoyed every item we tried tonight. We capped off our night with dessert and a cappuccino and espresso from the dinner menu. We had the lemon curd pavlova, which melted in your mouth and was light as air. Its sweetness was complemented perfectly by the tart sea buckthorn berry. What a delicious way to end the evening. Recently Nota Bene placed #9 on Canada’s Best 100 restaurants list, and based on the amazing dishes we had and the Spanish-style, elevated gin and tonic experience, it was very easy to see why. If you haven’t been to Nota Bene yet, with the G & T program, the new 4 TO 7 menu now available, and the high standards that placed it among Canada’s elites, it’s definitely a must visit. Nota Bene is located at 180 Queen St. West, just west of University Ave.